Long Beach, Calif. – May 31, 2014 – Formula DRIFT entered Homestead-Miami Speedway for the first time for Round 3: Miami Heat. 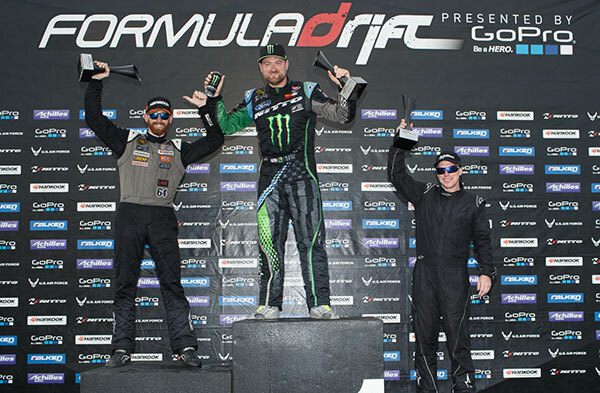 Vaughn Gittin, Jr. in the Monster Energy / Nitto Tire Ford Mustang RTR takes his second consecutive victory. Round 3: Miami Heat entered Homestead-Miami Speedway for the first time. The Pro Championship competition highlighted a jam-packed weekend of activities that included the kick-off of the PRO 2 Series competition and Offset Kings car show. The final battle pitted Vaughn Gittin , Jr. against points leader and the number one qualifier, Chris Forsberg in the Hankook Tire Nissan 370Z. The final battle was close, but Gittin was able to out perform his rival to earn his second consecutive event victory moving into second place overall in the championship standings. Forsberg retains the lead by with a ten point margin heading into the fourth round of competition. Rounding out the podium in third place was the number three qualifier, Kenny Moen in the Achilles Radial / Bridges Racing Nissan 240SX. The 2014 Formula DRIFT Championship season continues with Round 4: The Gauntlet at Wall Speedway in New Jersey on June 20-21.